Franz Schubert (1797-1828) composed a vast amount of work in his short life, including one of my favourite symphonies of all time - his Symphony No.9 in C major 'Great' (D944). His compositions for piano are delightful, but he is most famous for his vocal works, especially Lieder (songs) for Voice and Piano. The words "and Piano" is often emphasised not only because Schubert also wrote many songs for Voices and other instruments, but also because of the equal importance he gave to the voice and the piano - so that the piano is not only an accompaniment, but part of a duet. I narrowed my choices down to 3, namely his two song cycles "Winterreise (Winter Journey)" (D911) and "Die Schöne Müllerin (The Beautiful Miller)" (D795), or just a collection of his other songs. Dietrich Fischer-Dieskau, undoubtedly one of the best baritones in the latter half of the 20th Century, have some great recordings for both of the song cycles. At the end of the day, I decided to go for a collection of his Lieder. And even here I am torn between Elisabeth Schwarzkopf and Barbara Bonney - both of them sopranos and, together with Jussi Bjorling, my favourite classical vocalists. 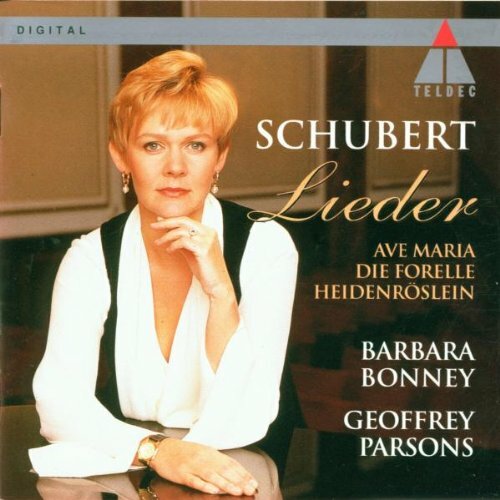 Schwarzkopf's performance (with Edwin Fischer) is decidedly more old-fashioned and more dramatic, and Bonney's (with Geoffrey Parsons) more fresh and better sound quality because it is a newer recording.